I plan to visit Leh in a car provided to me by my company for my personal use with white number plates. RC is my company’s name. Can there be any problems if I go beyond Leh e.g to Nubra valley on this car? Also a few sites still mention ILP are required for Nubra and Pangong. Is this correct? Visited both in 2014 without any ILPs. Is there any recent change in the rule? As long as you can prove that you work for the company, it should be OK. These documents will suffice. And yes, since April 2017, ILP and environment fee are reintroduced again as mentioned in the article above too. – Any idea how much time it could take to deposit money at TIC Leh? Hoping that not more than couple of hours in the morning and we can leave for Diskit on the same day. Any contacts who can do this for me in advance? – I am planning to go with my Family (wife and 5 year old daughter) on my 2014 Fiat Punto 1.3 Diesel which has covered 44,000 kms so far. Route is Jaipur to Leh and back via Srinagar starting 1st July. I plan to cover Leh-Diskit-Hunder-Panamik-Leh on my Punto and then take local cab for Leh-Pangong-Leh. Me and my cousin did the same route in 2014 on a Maruti Estilo which gives me good confidence. Do you foresee any issues / any comments? Also, I Will not recommend going over to Nubra Valley without at least one complete day of rest and acclimatization in Leh especially with family. You can do both Nubra Valley and PAngong tso from Leh on your car. Just be cautious and careful, drive slow on dirt tracks or roads with pebbles/stones to avoid puncture. I am planning to rent a bike from Chandigarh for leh Ladakh via srinagar then coming back to chandigarh via Manali. There is some news going on that the manali bike association will not allow rented commercial bikes from outside states. Can you please help me and confirm if I can take the rented bike from chandigarh and complete the trip as I have planned? Please let me know if the rented bike from chandigarh will create any issue in the travel path. Yes Nirmit, no Ladakh bike can cross Sarchu post and allowed in HP and no HP bike is allowed in Ladakh to enter. There is too much tensions going on and I will not recommend taking the rented bike to Ladakh unless things settle down. If the rented bike from Chandigarh is the white number plate and we say that this bike belongs to a friend of ours. Can this help in tackling the situation there ?? i am planning the following , will it be possible ? DAy 6 Sarchu to Manali. day 7 return flight from leh. regarding ILPs , we can apply online but for hanle via chushul there is no option ! Prasun, in your second plan, better use Day 6 for rest or sham valley trip on Day 2. This will help you acclimatize a bit more. Then follow rest and take flight on Day 7. You can apply for hanle permits at DC office in Leh or in person at Tourist info center. We hv planned ladakh trip from 7 to 17 September 2017 starting from srinagar n ending at manali. We have planned to travel by our own bikes n planned to cover places like pangong tso moriri hundar khardung la etc.. So please tell me is it fine to travel by our own bikes in leh ladak considering the current taxi n bike mafia scenario? And can we get permits for all the places at the same time for 12 days? Yes Atul, there is no issue at all by traveling on private bikes. Do not be afraid, they are good and helping people and just want people to respect the rules they have laid to curb outsiders commercial people minting money from their resources or opportunities. Private bikes or cars do not have any issues right from the start except just one ugly incident that happened. YEs, you can apply the permits once for all days you are in Ladakh. I want to visit Ladakh this early August and want to camp there i am carrying my tent myself but i need to get government permission for that can I apply for that online? If not where to contact I will be going from Manali-Leh route and how much time it will take the whole process of permission. First of all thanks for all the information, its really helpful. I just wanted to know if the inner line permit for an Indian citizen is issued on driving license also or only on passport? Yes Ravi, you can apply for inner line permit with Driving License as well. i am planning to go to leh ladakh in 16th june from ahmedabad(gujarat) alone. my bike is on my mothers name….will there any problems? If I take proper papers which make sure them that I am son of her…does it works. Sir there are two possibilities. Yes, it works for sure. If you have a passport it will work and also since surname will match that will work too. No need to change the name of the book. what is the process for getting ILPs for hanle? is it okay i download this form and mention all places that im planning to visit?? 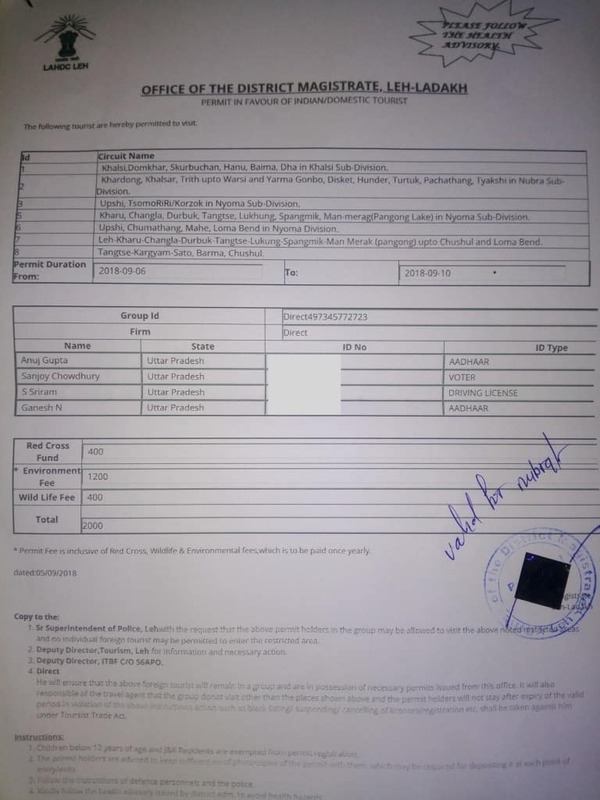 Kaushick, yes, download the form mention all the places, go to DC office in Leh, pay the environment and permit fees and get it stamped by DC office. 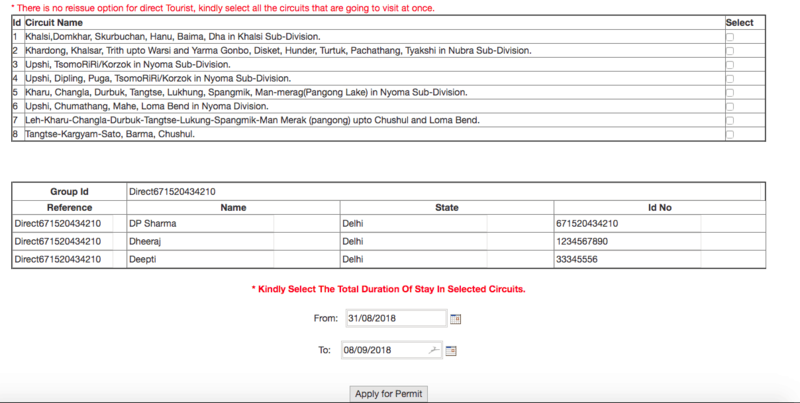 Once done, get the 10-12 copies of that permit to submit on various checkposts to the places like Nubra Valley, Pangong Tso, Hanle etc..
ok sir..what all places to be mentioned if im travelling from leh to hanle via chumathang? Leh, Loma, Nyoma and Hanle is sufficient. Hey Sai, you need Rohtang Pass permit to go beyond Rohtang Pass. And once in Leh, you will need Inner Line Permit from DC OFfice in Leh. Also, your plan is too too ambitious and I will not suggest such a plan. There is no rest day in Leh, then you are directly sleeping at Sarchu from Manali which will cause AMS issues. 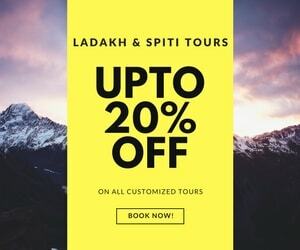 Yes sir according to your blog i have read that we need to have some bookings in LEH to get the permit for Rohtang pass, but we dont have bookings. What we have to do now? This year onward it is not required to have the booking to get Rohtang Pass permit. Thank you very much sir :). 2) we will stay at jispa, then sarchu and then at rumtse after which we will directly head to pangong tso. Read in your article that you need inner line permits which we need to get from LEH DC. Being Indian nationals, does it apply to us as well? Do we need to first head to Leh DC get the required permit and then head back to pangong tso? Your inner line permit is solved but I will not recommend the plan you are planning to undertake. Day 3 : Leh rest day and acclimatization, permits are now available online. Can we get inner line permit in one day ? Yes, it is a trivial process. Just have your documents ready and pre-prepared by downloading the above form. Just go there, submit the fees and get the permit signed. Then on the way back make 10-12 copies of it. It will not take more than couple of hrs at max. Thanks a lot Dheeraj. Based on your suggested blogs we have already palnned our trip. Now we are only debating which is a better route to take for a first time traveler to Leh assuming we are not planning any other trip to Leh soon. Thanks a lot for your feedback. We are all set to go next week. Just wanted another advice about going thru the Srinagar route. Given the situation in the valley, should we do the to and fro trip via Manali or should we continue with our plan to enter Leh via Srinagar – Kargil route. Thanks for helping me in other pages, now I have booked my tickets and have my itinerary. I arrive in Leh on Aug 9th (2017) and leave on Aug 19th. I will be renting a bike from LEH. Will I need to get inner line permits as I will be visiting Pangong TSo , Tso moriri etc… If yes then where should I apply for them? Can i apply online or only after reaching Leh? I checked leh website – lahdclehpermit.in. No where it is mentioned about permit for Indian citizen. They are asking only oversea clients. Is there any other website where this notification is published. Hi! I am an avid follower of your website and have taken numerous advice from it! My 3 friends and I are scheduled to land in Leh on 13th May and to depart for our home on 20th May. Now we had an entire trip planned with Nubra Valley, Turtuk and Pangong in our plan. We reached out to Thinles of Botho guesthouse, someone who came highly recommended in tripadvisor. Everything was on schedule when suddenly I learned today from Thinles that Leh is now currently not giving Permits to tourists from SAARC countries 🙁 This is so sudden and I saw no news of this anywhere! 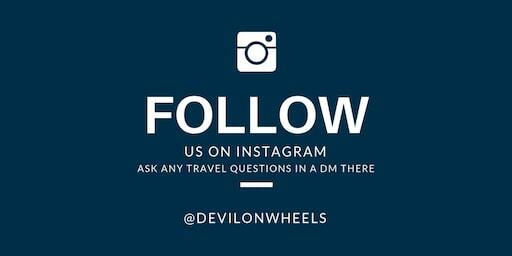 Now, do you have any suggestions for us as to what to say to the DC office once we reach Leh? We want to try again for the permit. I did check that website and there is a FAQ PDF there as well where it mentions some countries like Pakistan and Afghanistan requires permission from the Home Ministry. There is no mention of Bangladesh in that document. Thank you for the very quick reply as always! Yes Samy, also try to apply for Online Permit and you may get it. There was another person who posted in the forum that Bangladeshi citizen require only Protected Area Permit now and the option comes while filling up the online form. Please check it. This looks good Ketan, you will need a permit for 5-6 days from DC office in Leh for places listed from Day 4 to Day 8. No other permit is required. Just take care of the fuel and ensure there are other vehicles in company to support on these desolated routes. Only one permit is required. Sure, feel free to post any further question about your trip. As per our itinerary (see below), we will visit Khardung la, Hundar, Turtuk, Panamik, Aghom, Shyok, Tangtse, Spangmik Pangong Tso-Man- Merak – Chusul – Tsaga – Loma – Hanle-Nyoma and Tso moriri from Leh and then to Manali. 1.Please suggest what we need to do to get the ILP, and from where we will get it? 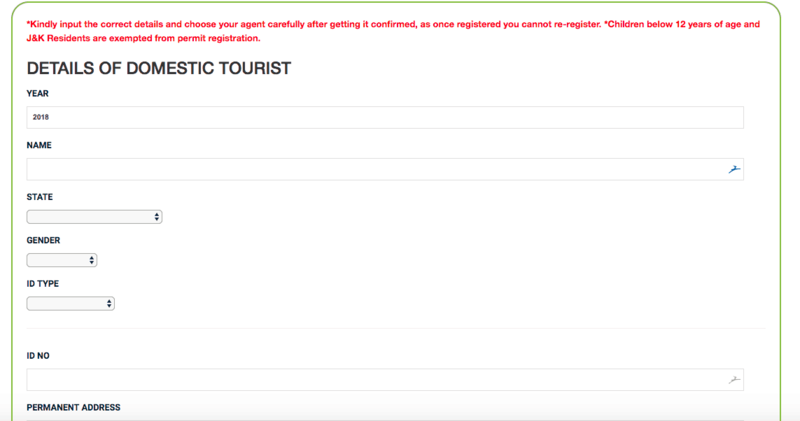 I downloaded the form, but could not understand where we need to mention the places we intend to visit. 2.What will be the charge per person? Is the environmental fee Rs 400 needs to be paid one time or for every day of the trip? That will be huge then..
3. what documents need to be submitted? 4. Will the drivers will arrange the permit? or we have to do ourselves? # If Tangtse cannot be reached directly from Hundar, then stay only 1N in Hundar…and Hundar to leh on nxt night and then Leh to Tangste. 2. Environment fee of Rs 400 is one time, permit fee of Rs 20 is per day. 4. They can do so on your behalf, will need all the documents and filled, signed permit form from you guys. 5. Your plan looks OK but DO NOT venture into the Niddar route alone. thanks but it is possible to go tso moriri by bus and any vehical available for tsomoriri to tso kar.debring and return to leh. Sir…do we require inner line permits to visit places like nubra valley,khardung la,tso moriri? whats the recent announcement about sir? What about Visiting the area of Batalik village and the road that takes to the villages Dha and Goma Hanu ? Are they excluded from present ILP requirement of 2017? India loves red tape and bureaucracy. Three cheers to it. You will need permit to visit Dah Hanu. 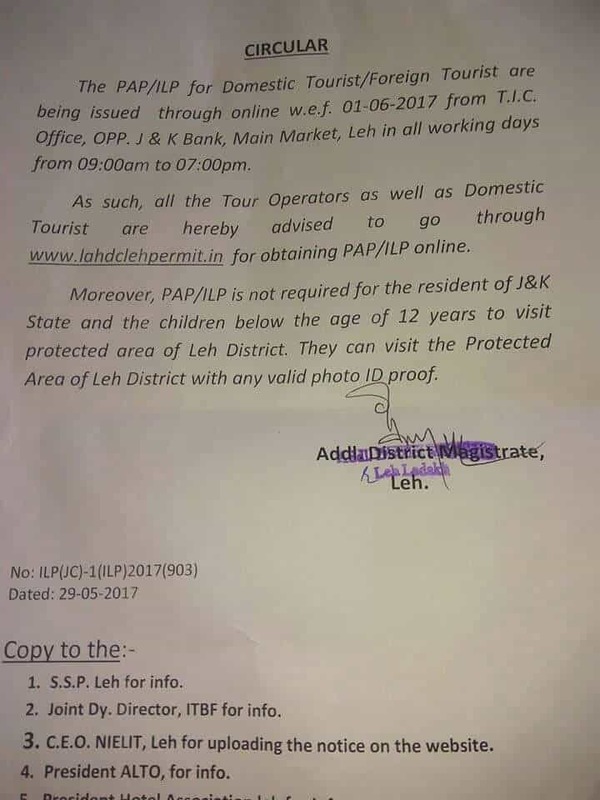 As per recent update, everyone need permits to visit inner line areas in Ladakh. I heard that in order to travel from kargil to leh via batalik and dha hanu, we need to take inner line permit (ILP) from kargil for batalik and ILP from leh for dha hanu. 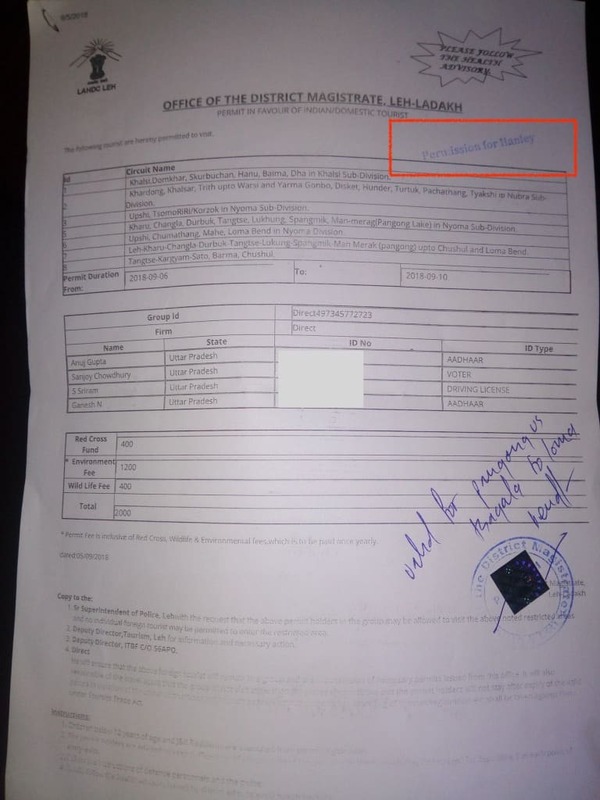 As I will be travelling from srinagar to leh via kargil-batalik-dha hanu-leh , I can arrange ILP for batalik from kargil DC office (as heard again, plz correct me if I am wrong), But my confusion, annoying, worry is how can I arrange ILP from leh to visit dhan hanu before I actually travel there (to leh) as I dnt have any plans of returning back as I have further plans to visit manali. Please help ! 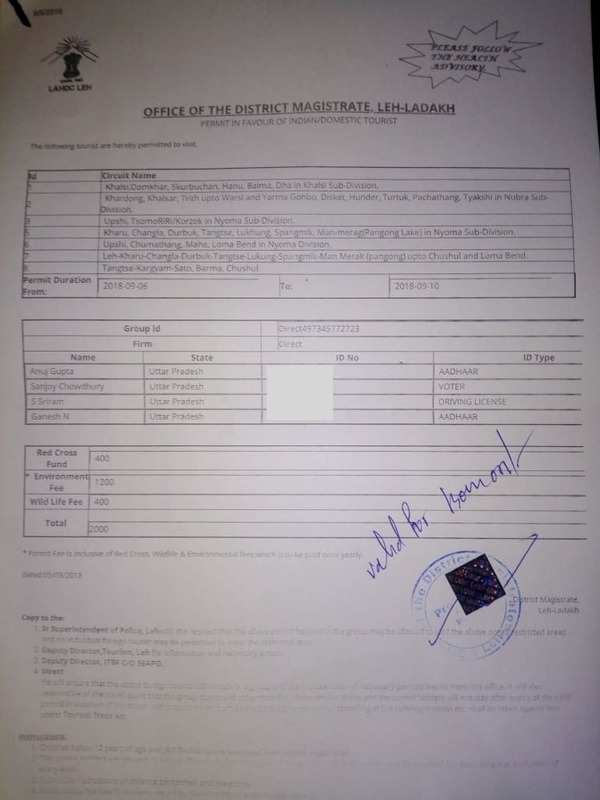 Deepak, people who travel in the direction from Leh to Kargil to Srinagar via Batalik route gets the permit from Leh and those who travel from Kargil to Leh gets the permit from Kargil DC office. So, you can get it from Kargil DC office and you should be good. Also, you can visit Dah hanu without going from Batalik and without needing any permit in case traveling from Kargil to Leh. Hope I am very much clear in making you understand what I want to convey. You can just write both Batalik, Dah, Hanu on the form when applying for permits at Kargil DC office. The Dah Hanu, permits are restored this year only and still there is no official statement on permits but just on environment fee. However, people are applying for the permit and paying the environment fee as it used to happen before 2014. So, I believe you will not have any issues with it if you just write Dah Hanu, Batalik while applying permit at Kargil office. Thank you Dheeraj. Thanks for update. We people can travel worry free because of people like you helping the enthusiasts all the way. Really appreciate and wonder how you reserve time for DoW. Read about Leh Innerline Permits are back from DOW. how likely is Leh DC office operating on SUNDAY!. we have planned ride in june, where we reach leh on Sat and Sunday is a break day before we start our ride to Nubra valley on Monday. now for Permits, we need to re-plan. can you suggest please. Leh DC Office does not operate on Sunday. You will have to either replan or arrange them in advance. I wanted to know if i can build tents in places like Nubra, pangong, hanle, moriri and jispa! Is it allowed to build our own tents? Or they(locals) won’t allow us? Because we are tight on budget. This is Amol. How are you doing? I have one question regarding permit, do we require permit to Visit Spiti Valley ( we are planning to go Shimla Via Keylong Khibber Kaza Pooh pangi ) If yes then from where we can get this permit. I am doing good Amol, thanks !! Indians do not require permit to visit Spiti Valley. It is only applicable for foreigners. Thanks Dheeraj. We are planning to go Kaza from Leh keylong and kaza Do you have any idea when keylong kaza road will open ? Amol, Keylong to KAza road has been opened yesterday. Thanks A lot Dheeraj. We are leaving on 10th From Pune. Wonderful, best wishes for your journey. Do share the updates with all of us, it will help others too. Little bit off topic but how can i avoid Taxi union of Leh as i am going there with rented bikes.. is there any way? I’ll ride with 3 other bikes! The bike company where we are hiring said there won’t be an issue.. is it true? As we are students hiring in leh will cost us more! In case you are lucky and not confronted, you may avoid them else if checked, you will have to park the outside rented bike and hire another bike in Leh. 11: tso moriri to sarchu. Now the things is thay if and only if we don’t need a buffer day i really want to go to Kaza in spiti valley. Do you know how to plan my trip so i can include Kaza in my list? Is there any road goes to kaza from keylong? Or should i start after reaching Manali? Tso Moriri to Keylong, Keylong to Chandratal, Chandratal to Manali in one day but doing it this way with Kaza does not make any sense to me. Let’s say i have two days after reaching keylong . What do you suggest? Again within two days it won’t make any sense to visit KAza as you will not be able to see much things up there. It is better to visit Chandratal lake in Spiti Valley and come back to Manali in those two days. We are three friends and we are planning for Leh this June, last week most likely. We plan to go manali by bus and then hire 2 Bullets from there and then drive all the way to Leh. Also we plan to drive Kargil from Leh and then back to Leh. 1. what all locations you would advise in Leh or near Leh to visit. 2. Moreover, we plan to do sleepover in tent is that possible in that region? I mean we putting our own trek tent. 4. We are 3 guys and will be renting 2 bikes, so pillion will also be there. is that ok and what challenges we should expect with pillion. Firstly, you should know that outside rented bikes are not allowed for sightseeing in Ladakh. You will again have to rent a bike in Leh so you pay twice. Also, return back the bike in Manali as pickup charges of bikes are too high and leaves a big dent in the pocket. 1. I will be able to suggest a plan, once you let me know how many days you are planning for this trip. 3. That is fine, you need two days for it. Thanks Dheeraj for you experienced response. We are planning a trip of around 9 days excluding travel to manali from where we are taking the bikes. Regarding renting bikes again in Leh, we heard that manali rentals charge 50% when we display the receipts of Leh rentals. So we are planning on that. After reading your blogs me and my friends decided to rent bikes from delhi and travel to Leh via Srinaga-Kargil and then coming back via Leh-Manali side. Andy, you will have to hire the bikes again in Leh. I hope you are aware about the rule. Firstly, your site has been such an amazing place in help planning our Leh trip! I am from Bangladesh and was hoping to take a peek at Nubra Valley and visit Pangong Lake. Is ILP something that Bangladeshi’s still require in 2017 to visit these places? If so, what is the current procedure for this? Sami, Bangladesh citizen need special permit from MHA Delhi to visit Inner Line areas of LAdakh and for the last 5 years or so, I haven’t come across anyone who got that permission or may be they never cared to share up here 🙂 … So, ILP is only applicable for Indian Citizens, Protected Area Permit PAP is valid for Foreigners. Permit for citizens of Pakistan, China, Afghanistan, Bangladesh and Burma are issued by the Ministry of Home Affairs (MHA) and permits for those people who are on diplomatic or official VISA are issued by the Ministry of External Affairs (MEA) in Delhi. Hi Dhiraj..need your expert opinion/ views/suggestions for ladakh sight seeing itinerary in august 2017, I am planning to do stok kangri in the first week of august. the dates are 5th aug to 14th august for the trek from leh to leh. i want to club this with ladakh sight seeing, especially from the perspective that if i do some sight seeing before the trek, it will help me acclimatize better. at the same time, i do not want to tire myself by doing all the sight seeing before the trek. So in short, I feel that i should split the sight seeing into two parts viz before and after the trek. Considering this scenario, could you please suggest me some good itinerary. Since, will be in ladakh around 15th august, would also love to spend 15th aug at either leh war memorial or karlgil. Please share your views on the best possible itinerary so that i could cover all major sight seeing places in ladakh. That’s OK, I replied to your other comment. Yes..Thanks a ton for the valuable piece of input you have shared. Shall modify the itinerary considering the same..Thanks again. 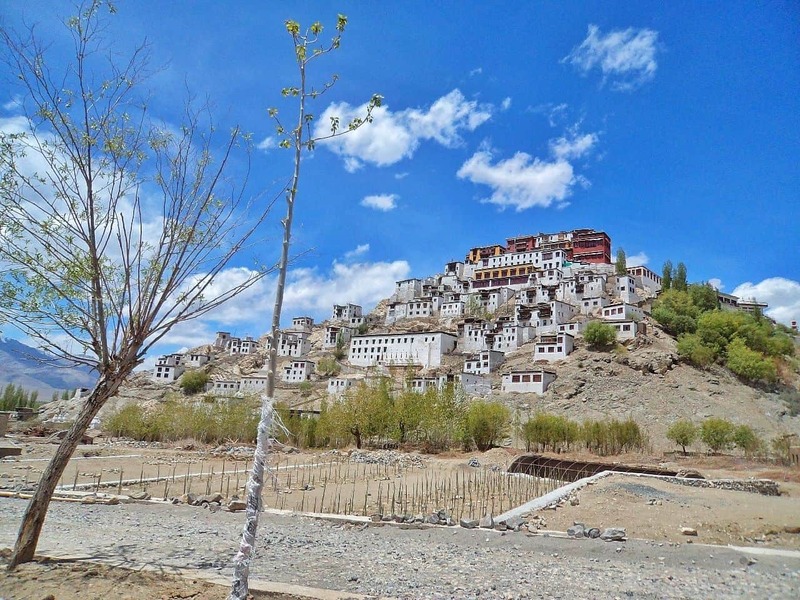 I feel you should first do a local sightseeing around Leh and Sham Valley including Alchi, Likir, Basgo, Magnetic Hills on the second day.Then start the trek and after the trek you may travel to Nubra Valley and Pangong Tso. How many days before 5th and after 14th you have for sightseeing in Ladakh. Thanks Dhiraj for your prompt reply. Posting below the tentative plan we have chalked out as of now. Please share your views on the same. You will be tired with the above journey without much rest day. Also, it is highly recommended that you do acclimatization in Leh for one day before making journey to Khardung La and beyond. Better follow it else it might end up scaring you with AMS and jeopardising the entire trip including trek. 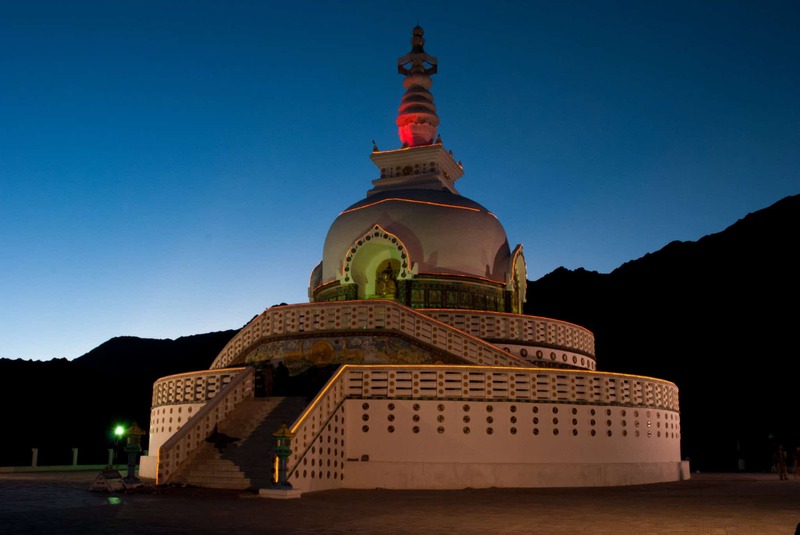 Better skip Tso Moriri part and visit Nubra and Pangong Tso only after one day rest in Leh. This would be my second visit to Leh and I would be doing in Dha-Hanu area by the end of May 2012017 along with PANGONG Tso. 1. Will I require ILP to visit Dha-Hanu area? 2. Will the road to PANGONG Tso be open by MAY end ? Chukhu, no permit is required for Dah – Hanu in case you are traveling from Leh side. Road to Pangong Tso will be open as it remains open even in winter months too. All depends upon weather during that particular day. IN case it is very harsh and with heavy snowfall, then BRO may not allow the passage on that day. Sumit, it looks OK to me but you can also try to ask for a quote from [email protected] too. In the past they have been proved to be economical and with good feedback from various readers here for last 3-4 years now. Dear Dheeraj as written earlier I have planned my visit to leh going first time. Wd reach leh on 19thapril morning and wd depart on 26th april. Kindly give me itenery for the tour which all places to visit. I wd be hitting a bike in leh so do & don’ts for it too. Bike ride will only be possible for local places around Leh and may be up to Lamayuru/Sham Valley which ever you will opt for. This is because the conditions of high mountain passes are very slippery and army do not allow bikes to ply on those roads as any mishap can be fatal at that altitude. So, please avoid at any cost. You can roam around Leh. I am suggesting a plan below of 6 days. You can add Turtuk in it while in Nubra Valley as a day trip from Deskit since you have 7 days in hand. Thx Dheeraj for information. I have seen pics ppl traveling to khardung la on bike so we can also go on bike, if not reasons plz. Sd we opt for share taxi for other places if not why. Asking u as it’s our first visit to laddakh. It is not that bikes are not allowed to be taken to Khardung La. What I am trying to tell you is, that during the winter months when snow is present on roads and hard ice makes it very slippery conditions at high altitude passes like Khardung La and Chang La, army does not allow people to take bikes for the safety of the riders. Once the summers comes in and black ice is not present on the road, then bikes start plying on such routes. Hence, in April you can only use bikes for local sightseeing around Leh or up to Sham valley for your own safety. Again getting a shared taxi could be difficult due to lack of number of tourists in off season of April. In case you find people who are tourists you can go ahead and share the taxi with them. However, in local taxi you will just do destination to destination without any stops in between where you would have liked to stop the car and take few pictures. I want to go to the Hanle with my dslr is there any way to talk out of it? As i read in some of your post that they take the camera at Loma post. Any permission or extra fees for cameras? Now a days they do not check for cameras and mostly allow. I have plan for my trip in ladakh..
Is it feasible to do all this in trip? What do you suggest i should include or exclude? What route shiuld i take for hunder to pangong? Anything you want to suggest? Thank you! Arth, your plan is very well balanced. You should take a call after reaching Nubra Valley. 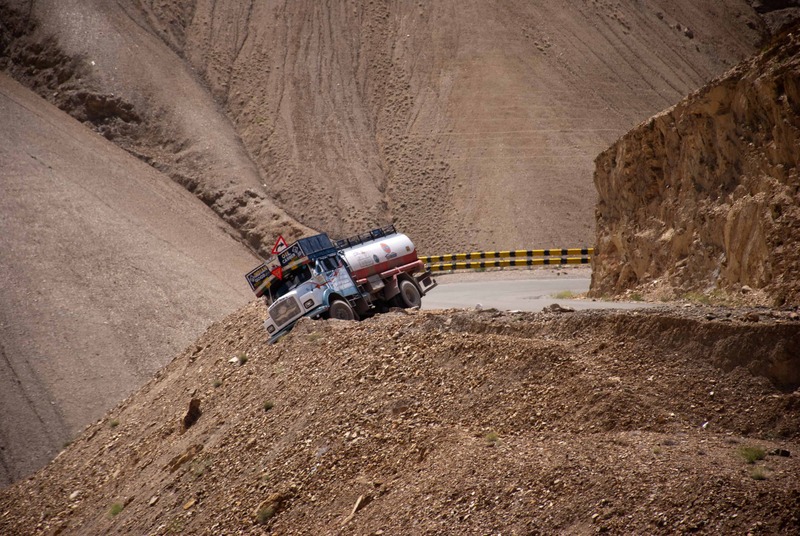 If vehicles are traveling up and running on Agham – Shyok route, you can take that route else take Wari La route. Also, both the routes should only be taken in case you have couple of vehicles in a convoy. If not then wait at Agham village to join a group of vehicles. Best wishes for the trip, feel free to post any further queries you have for the trip. Hi Dheeraj, we’re planning a Ladakh trip on May last/ early June 2017 from Kerala on our bikes..the rough plan in Ladakh area is like Leh-Khardung La-Nubra-Shyok-Pangong-Marsimik La-Chushul-Loma-Hanley-Chumur-Tso Moriri…I understand Marsimik La, Chushul, Hanley & Chumur needs ILP. So, would it be okay if I mention the places like “Lukung-Pobrang-Marsimik La-Man-Merak-Chushul-Tsaga-Loma-Rhongo-Hanley-Salsal La-Chumur-Charchang La-Tso Moriri-Sumdo-Mahe-Nyoma-Loma” in the application form??? I’ve added Sumdo-Mahe-Nyoma-Loma part, because I saw it a bit difficult to get the Chumur permit..so, if they reject the Chumur part, I’ll be able to reach Tso Moriri via Nyoma-Mahe-Sumdo, right? ?Or Should I apply with a separate form without the ‘Salsal La-Chumur-Charchang La’ part if in case they’re not gonna give the permit for Chumur? You do not need to mention Lukung, Pobrang, Man, Merak, Rhongo, Chanchagan La, Sumdo, Mahe, Nyoma. Rest all places you should mention. Adding Chumur may result in denial of permit, so be sure. 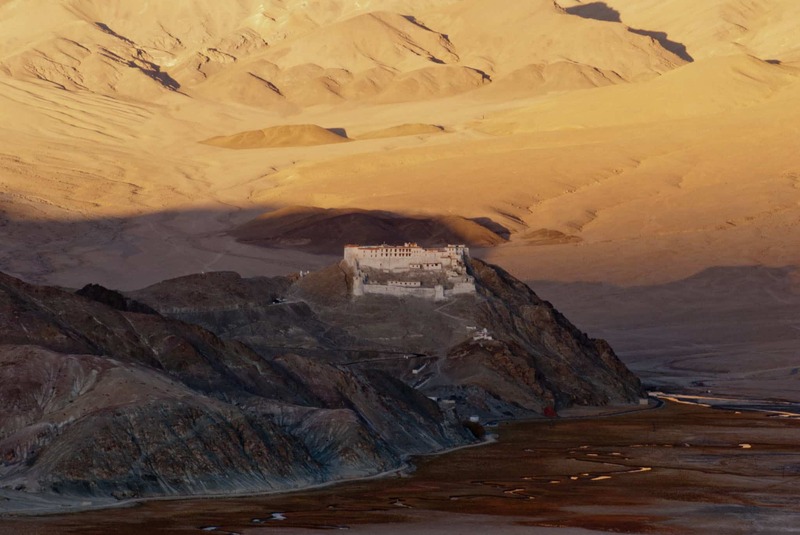 To reach Tso Moriri, you do not need to go to Chumur. There is a slip road just after you cross Salsal La which takes you to Tso Moriri. Better have a good story as towards the other end of that road army will stop you for whereabouts and why you took this route. One last query :)..so, if I mention like “Marsimik La-Chushul-Tsaga-Loma-Hanley-Salsal La-La-Tso Moriri” that will do the permit part? If they reject the application, should I ready with another form with “Marsimik La-Chushul-Tsaga-Loma-Hanley-Nyoma-Mahe-Sumdo” or should I include these places (Nyoma-Mahe-Sumdo) in the first form with Salsal La ( “Marsimik La-Chushul-Tsaga-Loma-Hanley-Salsal La-La-Tso Moriri & Nyoma-Mahe-Sumdo) so, even if they reject the Salsal La route, I can use the Mahe route? Yes, that will do for the permit part. No need for the other one. At max. what they can do is strike through Salsal La. No need to include Nyoma, Mahe, Sumdo. They dont need any permits. Salsal La is very remote route thats the only thing I will say about it. Rest you should be able to manage it. Hi Dheeraj, Does Kahrdung La, Nubra valley and Pangong need a permit now? Hi Dheeraj bhai, we’re planning to cover Nubra, Pangong, Marsimik La,Tso Moriri during our trip..As the permits are back for even Indian Citizen, a bit confused about filling the ILP application form.. Would it be enough if I mention the places like – “Nubra Valley-Shyok-Pangong Tso-Marsimik La-Chushul-Tsaga-Loma-Hanley-Salsal La-Nyoma-Mahe-Sumdo-Tso Moriri” ? Should I include anymore places? i would like to share my story about bike rental in Leh too. we got cheated by the rental company. i want to share my experience i hope this won’t happen to other travelers. i just back from kashmir & Ladakh trip. For non-indian, you can get the permit at any travel agent. DC office no longer issue the permit. Only travel agent can help. 1) Each travel agent give you different price. So, pls do survey to get better price. i found some ask for around 1000 rupee. The lowest i found is 650 rupee including processing fee. 2) if you travel alone, a bit difficult to apply the permit. most of the travel agent refuse to do because they may be have less customer and you the only one apply the permit. So, you have to put more afford do survey around Leh. i travelled with 2 friends, so a bit easy to apply the permit. we were planning to go to Nubrah valley, but after we reached check point, the officer took our permit and not allow us to go to nubrah valley due to heavy snow. We only managed to go up to Khardung La. Only taxi and car can go to Nubrah valley if heavy snow. we rented a bike. yeeenn, thank you so much for the valuable updates. These will be very useful to all other planning the trip to Ladakh. I am surprised to come to know that DC office is no longer issuing the permits. Did you go to DC office and someone in DC office confirmed or did anyone else tell you about the same? Hi, Thanks for respond. Yes we went to DC office. They told us, they no longer issue the permit and then we went to tourism office near post office in Leh to validate, the answer is the same. You only can get the inner line permit from travel agent. Pls do survey 1st. Each travel agent give you different price. This is very important. i would like to share my Ladakh experience here. There’s many good and bad stories. Can you tell me which platform should i write to share to public or readers here? Thank you so much yeeenn. I will surely add all these points to the articles. Iam a bike riding freak now posted in Delhi, this september begining i planned a trip to Leh via srinagar, and started by evening 5 pm from my delhi home, and reached srinagar by 9 am, but due to curfew the road was blocked till evening 5, then i reached sonamarg for night halt and started to early morning to leh and reached by 2pm in Leh, thought of going further a bit and halted for night halt in a tented accomodation, and started early morning and reached non stop to delhi by early morning. Gunasekar, I am glad you have made it in one piece to your family and by god’s grace nothing happened. You should be grateful to god. Firstly kudos to your efforts for the in-depth knowledge you have gained and keep no margin to share. We friends have planned a trip from Pune to Leh and ahead. We wish to cover Marsimik La. As I understand it needs special permit. Also being an Indian citizen I understand that we do not need any permit for Khardungla, Diskit, Nubra, Shyok, Pangong, Kargil, & Dras. Sorry but I am bit confused to which all permits are needed. So the basic queries as below. 1. Is permit (ILP) needed for anything mentioned above except Marsimik La? If yes, direct link please. 2. Which permit is needed for Marsimik La? (Direct link for form download please). You need all the above forms filled. Follow the process as explained in the article above when applying permits. Thanks for the timely revert & details and sorry couldn’t respond on time. Today morning I got an update from Leh DC Office that there had been some mis-happening between tourists and ITBP/Military Post enroute Marsmik La. Due to this DC Office had taken a strick stand that no one would hence forth get any permit for Marsmik La. This is very disappointing news for us. Can you please help in validating the news also if true, is there any way out or special permit that can be arranged. Also if you have any contacts who could help us in the same would be really appreciated. No, there will not be any way out. If army has decided not to allow permits then even if DC office will issue the permit they might not allow you to pass the checkpost. Same thing happened past few years when some idiots created ruckus on Pangong Tso to Tso Moriri route from Chusul. Army stopped allowing tourists on that route and since then only this year they allowed most of tourists else it was a lucky day kind of thing. Since, the update to you is from DC office, there cannot be more updated news than that. Hi dheeraj, your write ups are extremely useful. We are planning for a trip from delhi to leh via shimla – kazza- loser after jispa was planning to stay in Thukje or punga hot springs. later travel to chushul and via merak to leh, later towrds diskut and partapur on two wheelers on month of September. I am a foreign national and was just reading about the relaxation of PAP requirements for certain areas of travel within Ladakh. I am planning to cover Lamayuru and Pangong Tso whilst in Leh – is it true then that I would not need a PAP to visit these two places? There are 2 forms available here. Which is the one that can be used? I am not a regular visitor there. This is my first time and i would like to visit Chushul, Tsaga-la, loma and hanle. Please read the process on how to apply it. As I can see that no Bangladeshi citizen has ever get “in line permit” to restricted areas of “Ladakh”. Can you please suggest an itinerary for a small group of Bangladeshi citizen for 10 days trip from Srinagar-Leh-Srinagar including at least 2 days stay at each point. Or Srinagar-Leh-Manali with places to visit avoiding restricted areas. We are planning to make a trip to Leh ( 13-28 Aug). We will be renting bikes from Delhi. I just wanted to know the procedure for permits. 1> Are permits compulsory for bikes? 2> If yes , Can we get the permits online? 3> Do we need to be physically present to get the permits. 4> Since all of the bikes will be rented bikes, which all documents do we need to get the permit. 5> If the permits need to be made once we are in Manali, How much does does this entire process take? 6> Lastly, What are the documents needed to get a hasslefree permit. 1. YEs, you need permits from going from Manali side to Rohtang Pass. 2. No, permits will be available in person from SDM office in Manali. Pnly permits upto Rohtang Pass are issued online not going beyond it. 3. Not really, you need RC, PUC and DL to get the permits. 5. If you reach the office in time, hardly takes about 20-30 mins. Can you please suggest which is the best route to travel from Chandigarh to Manali with good road conditions and minimum traffic. Sanjeet, best is that you stick to Manali – Bilaspur – Sunder nagar route as it is shorter though do have traffic of trucks and bad roads of about 15-20 KMs. But it is shorter. However, the other route which goes from Una – Bhota – Jahu – Mandi is a longer route by about 60 KMs, devoid of traffic, very good roads mostly. Time taken by both routes is almost same and at times Manali – Bilaspur is faster. Next week, me and 4 of my friends( all Indian nationals) are planning to travel on rented bikes from manali to leh via rohtang pass( 1 night stay in sarchu). Then we will cover pangong lake, khardung la and nubra valley in 4 days. Please inform me about the permits that will be required to complete this journey. Hi Dheeraj, I have been to Leh (followed your advise and entered from Srinagar side and left from Manali). I found that though ILP is not required for Indians but declaration of all travelers on a form is still required and the form (2 copies) needs to be submitted at two of the check posts. Not sure if they will allow to pass without the formality of this form. I got the the photocopy of this from one of the travel agent in Leh main market for Rs. 5. Yes Asif, it is just a form for noting down how many people passed, who they were and when. It is available for download too and one can take the copies themselves. Sorry for not being explicit about it, will mention for others in future. But, earlier permit was to be procured from DC office in Leh. I just wanted to ask if zoomcars are allowed in Leh Ladakh, or are these also counted as taxi’s. Travelling from Srinagar to Leh and returning via Manali. I am from Bangladesh. And Next month July’16 i plan to visit Ladakh. Every thing is confirm. Pls can u confirm me that is Bangladeshi citizen are not allowed for visiting Nubra & Pangong? Pls Hurry I don’t have enough time. If any person know about this matter pls let me know. Yes, you need to get permits from MEA, Delhi in order to visit Nubra Valley and Pangong Tso. So far, havent met anyone who got the permits in time AFAIK. Hello Dheeraj, Am just adding an extra question here. We 2 people on RE 350 & RE 500 bikes. Planning to travel from following route – Leh > Khardung La > Diskit > Hundar > Nubra Valley > Panamik Hot Springs > Then via Wari La > Sakti > Chang La > Pangong Tso > Man > Merak > Chusul War Memorial > Tsaga – Loma – Nyoma Tso Moriri > then via Puga > Tso Kar > Pang > Sarchu. 1) Please advise number of Petrol Pumps available on this route. 2) How is the stay accommodation in these areas. Hi, I’m on a solo trip to Ladakh, I will be riding to Tso Moriri from Leh and was wondering If i get the ILP will I be able to head to Hanle without much hassle at Army check posts? Are they particular about depositing camera at check post? Thanks Dheeraj, yeah fuel is another concern. I have a RE standard 350 that does not give great mileage. Tank capacity 13 plus jerry can 10 ltrs. I am wondering how I should plan Tso Moriri, Tso kar, Hanle and head back to Karu. Looks like I have to skip Hanle unfortunately. Unless you plan to carry extra fuel with you, it is difficult to do Hanle trip. You can try to rely on fuel available in hanle but there will be no assurance. Ravi, please read: Fuel Availability In Leh – Ladakh | Ladakh Self Drive Tips. You will get plenty of stay options up there in the form of home stays and small guest houses. my name is sanjeev i m planning to go ladakh with my enfield 350 cc , my bike is registered on my brothers name and Original RC is not issued till now but i have the registration papers and RTO paper that they use to give. Can you suggest with theis documents would i be able to visit pangong lake. Sanjeev, that shall be fine and I hope by surname you should be able to justify it if confronted. I just want to know, how bad is the road conditions from spangmik-man-merak-kaltse-chushul- tsa ga- loma to hanle. I have 4×2 high ground clearance mahindra tuv 300, is this safe for me to take my vehicle on that road. We are planning to go in july second week. Is there any chance that Army ppl will send us back if we go hanle from leh via Mahe, Nyoma,Loma –with leh DC permit ? I do not need any permit to visit Tso Moriri from leh . correct? Pawan, there is always 50:50 chance of it happening that you will be sent back from Chusul post. Last year they were lenient, wish this year too. Yes, if you do Tso Moriri from Leh via Chumathang, no permit is required.